With a winter storm barreling down on North Texas, officials canceled two major events scheduled for this weekend: The MetroPCS Dallas Marathon and the Children's Medical Center holiday parade. After meeting with the City of Dallas, Dallas Police Department and Office of Special Events, marathon officials decided Friday to cancel the event. 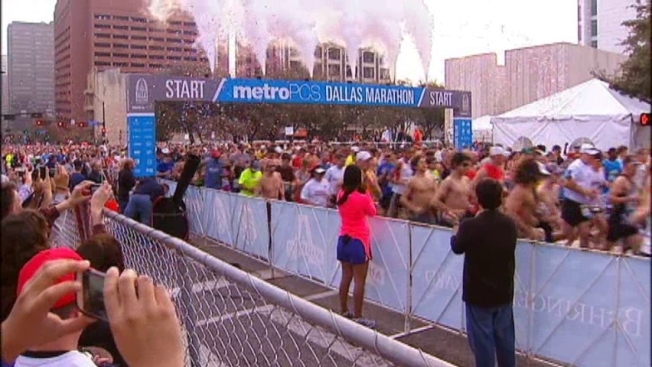 "Safety of our participants, as well as our volunteers and spectators, is our primary concern on MetroPCS Dallas Marathon race weekend," according to a news release Friday afternoon. "We regret that the race will not go on as planned, but are confident this decision is in the best interest of our runners, volunteers, spectators and the general public." The MetroPCS Dallas Marathon Health & Fitness Expo for Friday and Saturday was also canceled, along with some other events. Children’s Medical Center, which was going to host its holiday parade on Saturday, canceled the annual event on Thursday. It's the first time the parade has been canceled in 26 years. Before the marathon was canceled, runners were buying layers of clothing to wear in the race, including hats and gloves, according to David Douglas, a manager at RunOn! Dallas, a retail running store. “We haven't really been able to acclimate that much to cold weather yet. It’s always nice when you have a chance to do some runs in some cold, but we really haven't had that yet,” Douglas said. Douglas had competed in the Dallas marathon 14 times and planned to run again Sunday -- using a trash bag to stay warm. “It’s one of the greatest things that you can put over you. Keep your body warm,” Douglas said. Stacy Yervasi, who ran in this year’s Boston Marathon and finished 30 minutes before the deadly bombings, also wanted to run regardless of the weather. “I feel very strongly about running my hometown race coming off of Boston,” Yervasi said. Now, she won't get the chance.